Next residential phase off Budds Lane at Prince Philip Park on Tuesday 9th October 4pm – 8pm at the Bordon and Oakhanger Sports Club BOSC. Welcome to Taylor Wimpey and Dorchester Group public exhibition to display its proposals for an attractive new residential development on the next residential phase off Budds Lane at Prince Phillip Park. As you may be aware, the wider site was granted hybrid planning permission in November 2015 for the development of the site for up to 2,400 new homes including a new town centre, schools, employment and leisure and open space facilities. 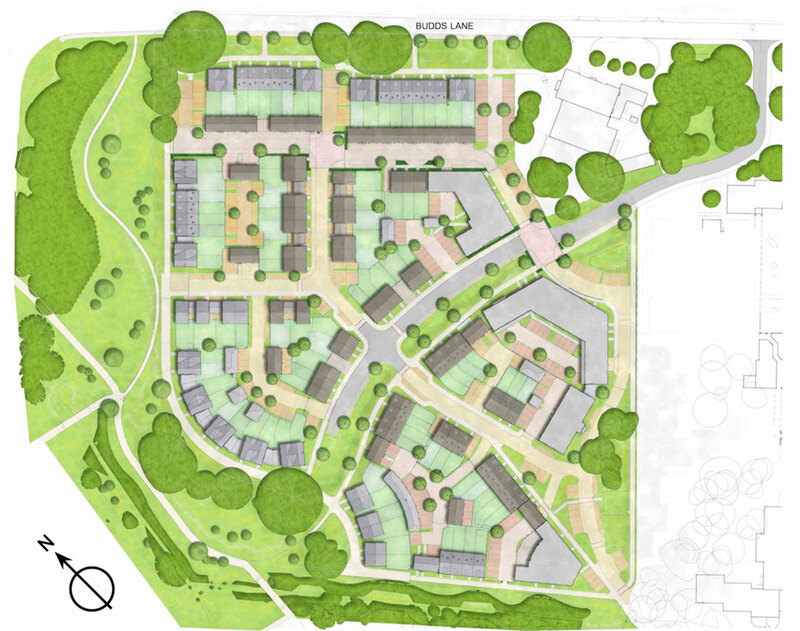 The proposals seek to develop land on the next residential phase off Budds Lane at Prince Phillip Park with 190 new homes, including up to 90 affordable housing, open space and associated infrastructure. Today’s exhibition provides you with an opportunity to view and comment on the proposals prior to the submission of the detailed Reserved Matters application. We are keen to hear your views so please do take the opportunity to speak to representatives of the project team and submit your comments on the feedback forms provided. Thank you for your interest and for taking the time to attend today’s event. The Illustrative Masterplan above shows the approved outline planning application in the context of the wider town. as Parcel 2.7 to 2.9. The site is located to the centre of the wider site, adjacent to the proposed town centre. The hybrid planning permission sets the requirement for a Design Code for each phase of the development. The Design Code was submitted to East Hampshire District Council for approval in September 2018. The main aim of the Design Code is to set out design principles for developers, so that development proposals can follow an overall vision for the site. The proposals have been designed in accordance with the guiding principles contained within the Design Code. Reserved Matters are the design details of layout, scale, appearance and landscaping that were reserved for future agreement by the Council. All of these Reserved Matters are yet to be determined by the Council and are therefore part of this application. 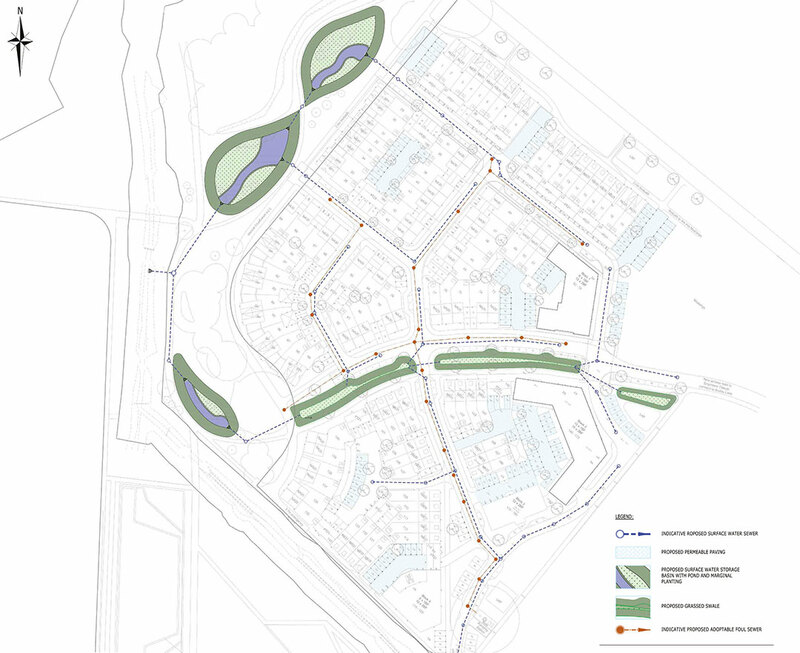 Matters such as the principle of development on the site, the point of vehicular access and the total number of homes that can be built on the wider site were agreed as part of the hybrid planning permission. While the proposals closely follow the concept developed for the outline masterplan, as shown on the previous board, the Reserved Matters proposals do not extend to the parameters of what is allowed for within the masterplan. An attractive mix of 190 new homes, including 1 & 2 bedroom apartments and 2 & 3 bedroom houses designed with distinctive contemporised elevations. 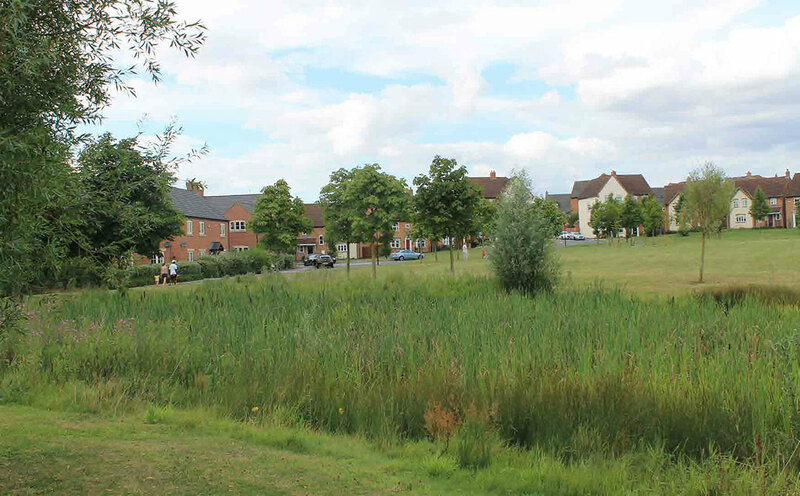 Buildings are designed around new areas of Public Open Space, as well as connecting to and addressing the Linear Parkland, the Woodlands, the “Oxney Moss” and strategic play areas. The proposals will include up to 90 new affordable homes. 2–3 storey buildings are proposed, with 4 x 3-storey apartment buildings located adjacent to the town centre re-development site to the east, with 2, 21⁄2, & 3 storey detached, semi-detached and terraced houses located beyond to the west. There will be 2 vehicular access points into the site, one to the north east corner and one to the south east corner. These will link up with the wider road network consented by the hybrid permission. There won’t be any direct vehicular access onto Budds Lane, only cycle and pedestrian. There will be a total of 404 parking spaces on site, designed in accordance with Highways’ requirements, including a proportion of visitor spaces. Parking is either in the form of garaging, car ports and driveways or in the communal courtyards. The proposal illustrated has evolved through discussions with Local Authority Planning Officers to meet the required planning policies on design. 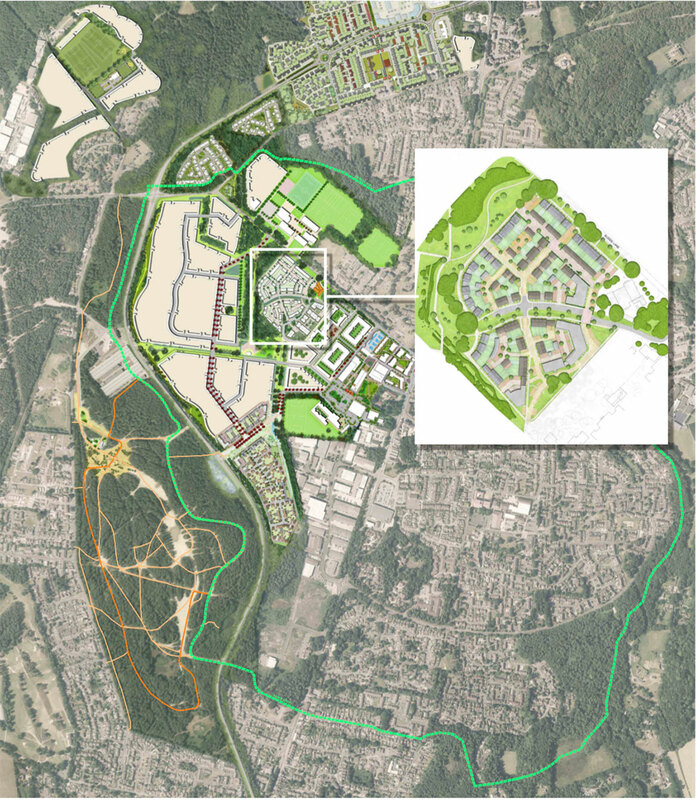 The scheme would deliver numerous benefits to the local community and East Hampshire District Council through the comprehensive Section 106 package as part of the wider Bordon Site. The buildings are Contemporary in design, with 3 distinctive Architectural Character areas. 3-storey apartment buildings adjacent to the town centre redevelopment proposals. 2, 21⁄2 & 3-storey terraced and semi-detached townhouses which directly face onto the landscaped areas around the sites periphery. All character areas exhibit elegant long vertical window proportions, providing larger areas of glazing to reinforce the contemporary architectural styling. 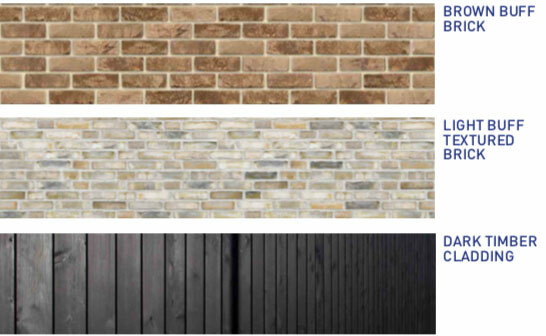 A mixture of contrasting brick colours and brick patterning, as well as the use of contemporary coloured boarding is proposed though out the development. The elevational design concepts have been discussed with the Local Authority Planning Officers to create a high quality environment which is attractive and distinct and will create a vibrant transition between the town centre redevelopment and the adjacent residential communities beyond. The landscaping proposals will be sensitive to the local landscape character of Bordon, ensuring the development acts as a suitable transition between the future Town Centre and the adjoining linear park, assisting in habitat creation, as well as providing opportunities for informal recreation. The proposed scheme will be supported by a detailed set of landscape proposals to demonstrate the desire to create a quality of public realm to enhance the setting of the proposed dwellings. 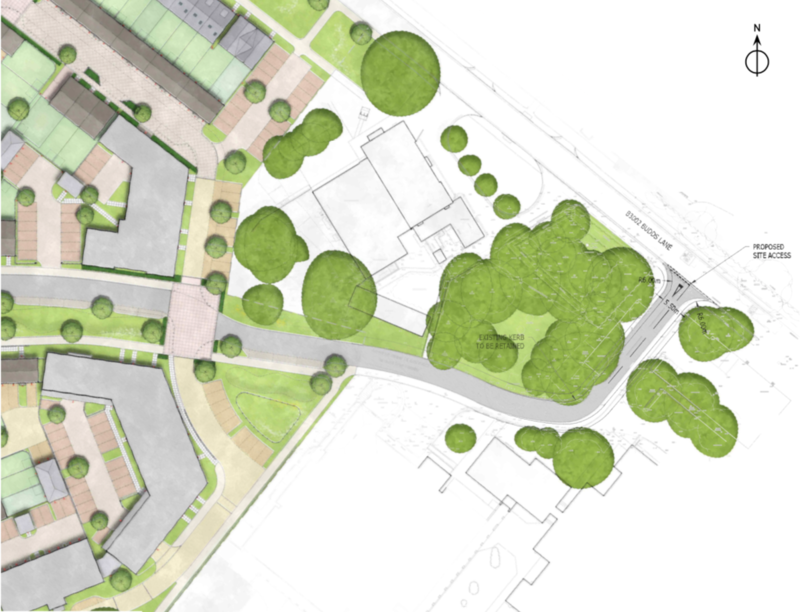 The layout carefully respects the wider character within which the housing sits, creating opportunities for a variety of landscape types to compliment the proposed housing. Plot frontages will be carefully considered to maximise opportunities for frontage planting using a wide range of ornamental shrub species to provide seasonal interest and colour, with limited use of formal, clipped hedging to provide structure and ensure a verdant setting for the proposed new dwellings. Following the detailed tree survey, significant trees worthy of retention have been identified and the detailed design of the scheme has sought to maintain as many as possible, to provide maturity to the overall landscape structure of the scheme. However, the proposed development will result in some tree losses, but any such loss will be mitigated by the planting of several new trees within the streets of the new housing area to provide softening to the development and in the adjoining Linear Park. The development also includes several small areas of open space with potential to incorporate opportunities for natural doorstep play, with links to the adjoining Linear Park, which will contain a wide range of passive and active recreational facilities. The site contains a mixture of habitats, including buildings, hardstanding, woodland and heavily mown grassland. A Preliminary Ecological Appraisal has been completed and additional surveys are on-going but at present the Site is considered to support high-quality grassland habitat, roosting bats and foraging habitat for Badgers. Mitigation and compensation measures will include the sensitive timing of vegetation clearance and demolition of buildings, preparation of Natural England Development Licences, habitat creation and provision of wildlife boxes. Additionally, net gains for biodiversity will be delivered by incorporating enhancements into the scheme to improve the site for wildlife. This will be through the retention of existing high value habitats and the creation of new, local habitat types. Overall, this will increase the quality, extent and connectivity of wildlife habitat within the development and throughout the area. A Comprehensive Transport Assessment was submitted to Hampshire County Council, as part of the hybrid planning application. Vehicular access to the site will be from the east via proposed road network connected to B3002 Budds Lane on the north east which is a distributor road with 30mph speed limit as well as to the south east into the adjoining parcel. All properties would have parking in line with the Council’s standards which equates to approx 1 space for 1 bed dwelling, 2 spaces for 2/3 bed dwelling and 3 spaces for 4 and more bed dwelling. 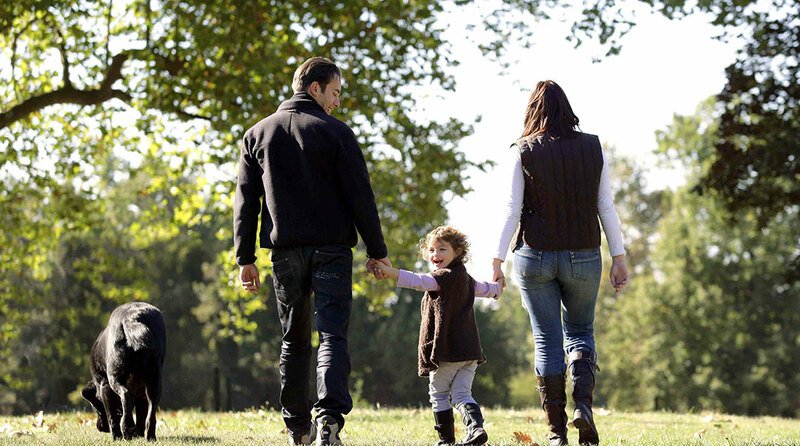 Access and leisure routes within the site and connecting to the network of public rights of way are proposed to encourage healthy and active lifestyles. 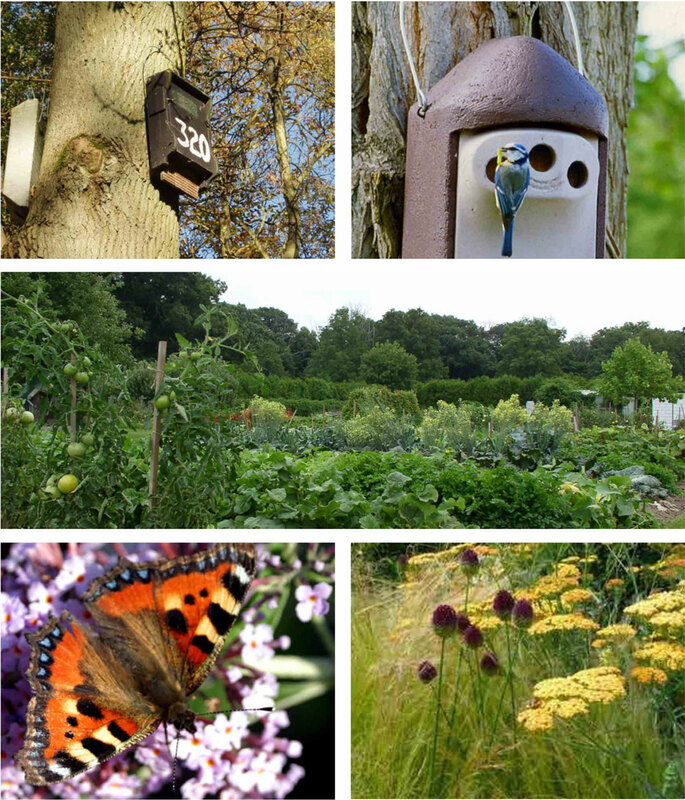 The development is situated in a sustainable location forming part of the wider Bordon site. 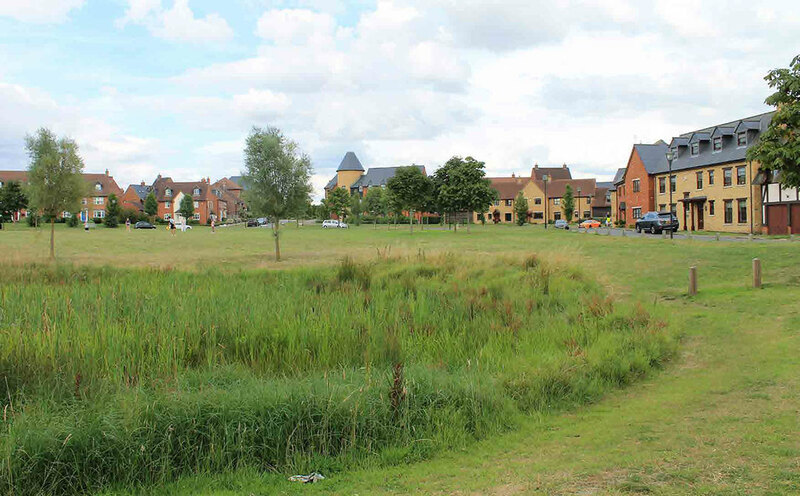 A flood risk & drainage strategy was approved as part of the hybrid planning permission. The principles of this will be expanded upon as part of the Reserved Matters application and will inform the adoption of a surface water drainage strategy that complies with the Council’s guidance. The rate of discharge will not exceed but may improve the calculated rate of discharge from the existing site. 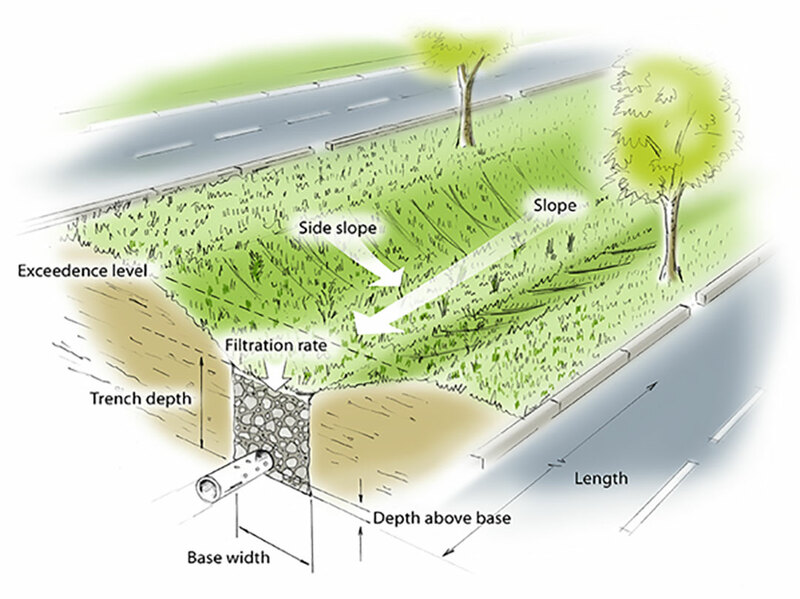 Sustainable Drainage Systems (SUDS) principles will be employed in the design to restrict the rate of flow from the site and improve the long-term drainage position on the site. The ground conditions on site have good infiltration rates and all of the surface water will be disposed of on-site in this way. The drainage network has been carefully modelled to ensure that the flow is restricted so that flooding is not caused on either the new development or downstream of the site and that all peak storms can be accommodated within the onsite system, up to a 1 in 100 year event including the effects of climate change. The foul drainage for the site will drain by gravity to a new adoptable pumping station to be located in the southern corner of the parcels. This will discharge via a rising main to an existing foul sewer that crosses Budds Lane and is connected to a Thames Water sewer to the north of the Primary School. Thank you for taking the time to attend today’s exhibition about our proposals to develop the next residential phase at Prince Philip Park in Bordon. We hope that you found the event helpful and informative. We would be grateful if you would take the time to complete one of the comment forms available. Following the exhibition, we will review the feedback received prior to submitting a detailed Reserved Matters application. 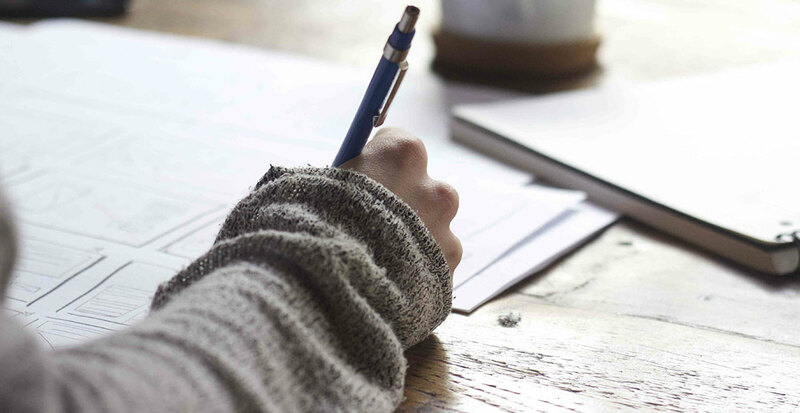 You will have a further opportunity to provide comments to the Council during the statutory consultation period that will be held following the formal submission of the application.